In recent months, I’ve had a rule that I don’t watch the news. This is a big step for me because I’ve always been a Big news junkie. Currently, I don’t want to hear about politics or the election. I especially dislike watching just to find out what the weather will be. On Monday, I already knew what the weather would be but I broke my rule. I got sucked into watching. I did want to know what was happening with Hurricane Sandy. I wanted to know not in a voyeuristic way…I wasn’t looking for buildings being demolished by a storm surge or anything like that. I just wanted to know. I spent my day trying to remain calm. I couldn’t do anything about the storm (or the Other storm for that matter!) and I decided that calm was the best course of action. Well, they’re still in one piece and they still work. I just need to work them. I’m going to try to meditate daily again. I’m always searching for focus and this will hopefully help. So maybe something good came out of the storm. We were very lucky. We lost power at about 7:15pm. We even heard the big pop of the transformer. We had lots of camping lights, oil lamps and flashlights. I strapped on my flashlight that goes around my neck and I read…of course! The lights came back on at 9pm exactly! There was a lot of rain, yes, but I’ve experienced worse rain storms. There was wind, but again I’ve seen worse. I haven’t checked my basement yet to see if any water got in. It’s an old basement and it leaks sometimes, but it’s not as though it’s a finished basement and everything that’s down there is on pallets so it should be Ok either way. All in all, I’d say that Hurricane Sandy was much kinder to us than we thought she’d be. I know a lot of people at the New Jersey shore had a lot of water damage…I saw some of the news footage. I hope everyone can get their lives back to normal quickly. Was the storm over hyped? In some ways perhaps, but it did look very dangerous and I think all of the governors and mayors who declared states of emergency were wise to do it. Better safe than sorry. Hopefully, we can all dry out and see some sunshine today. so glad sandy’s impact was not too severe for you, fran. we lost power at 5:15 pm til about 8 pm. luckily, i was at theOTHERstore where there WAS power, so i did not have to play camp-out (!). the winds here are SCARY right now – to be up to 90km/h! i like those meditation beads – glad you brought them out! maybe you can just find the weather report online? i am with you, i do not watch the news on tv!! stay safe, today (still!). Thanks, Cathy! 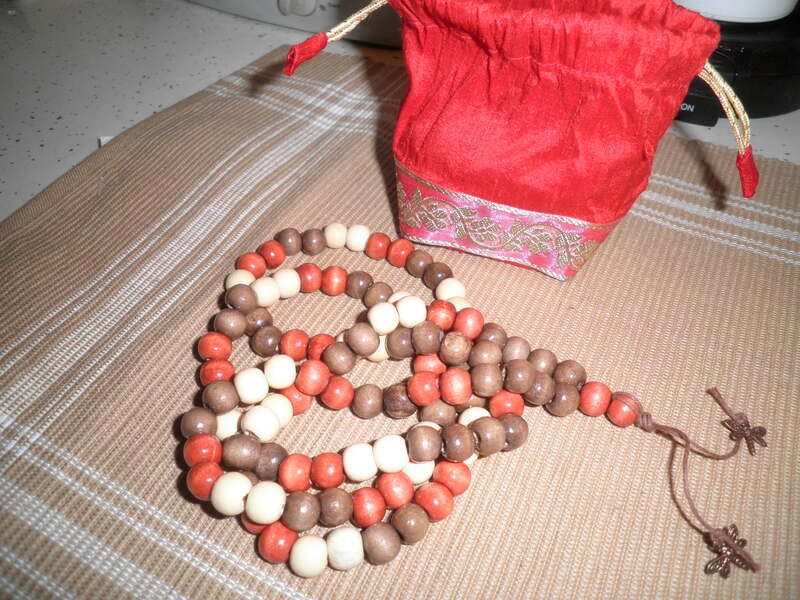 Glad you like my mala beads. I don’t do crafty things very often, but I was inspired to do it last year. I like how I feel when I meditate and I’m going to try to do it daily. I’ve also tried to start journaling which I haven’t done consistantly in a long time. Hope the winds calm down for you. I think the wind is the scariest part. Take care of yourself! How cool is it that you are using the same bag from Jim that I have my mala in! We are such sisters! So very glad that things were much better than expected. People laughed at me last week but as a girl who used to live in the country where the electricity went off all the time I have learned to be prepared. I can use my tupperware full of water to make tea and the extra box of water bottles can be used for reiki clients. But for me it was a much needed mental health day. Accomplished lots and intend to continue today.! Great! I need to get some things done today too. Getting a later start than intended, but oh, well! Talk to you later!! Glad you made it through ok. Our power went out at 6:30 last night and came back on a little after 10 this morning. We threw out our fridge and freezer food this morning. The wind sounded pretty scary at the height of the hurricane. We watched governor Christie’s press conference this morning and it sounds like a lot of places (like the shore) are just devastated. Sorry you had to throw everything out, Zo. We didn’t open the fridge or freeze during the outage so I think we’re ok. I felt so good when I was meditating and I just need to get back to it. It’s feels so peaceful! Take care and stay safe. So glad you’re safe and mostly dry! I’ve been worried about all my blogger friends and IRL friends on the East coast! Thanks, Allie! We’re doing well. I even saw a little sun about a half hour ago, now it’s over cast again, but hey…it’s a start! Thanks for worrying about us! Take care! So glad you weathered the storm! Those news reports freak me out too. Even if you’re not in the direct path, that serious, concerned tone is bone-chilling. We did really well, Laura! So many along the shore areas had terrible damage. We were truly lucky! Thanks! Glad you got off ok! Much worse here. No power for more than a week and trees down everywhere. Quite the scene! Do you have power now, Stacie? My gosh! Take care of yourselves!